Former Yukos head Mikhail Khodorkovsky has hosted a conference in Kiev to try to attract intellectuals, journalists, writers, and politicians to develop a “road map” for resolving the crisis in Ukraine. Russian experts are skeptical and accuse the former oligarch of bias. Former head of the Yukos Oil Company Mikhail Khodorkovsky is trying toattract intellectuals, journalists, writers, and politicians in order to develop a “road map” for resolving the crisis in Ukraine. In order to achieve this, he teamed up with Ukrainian civil society organizations, and on April 24-25, he hosted a conference in Kiev titled “Ukraine - Russia: A Dialogue”. Russian experts have accused the former oligarch of bias, expressing doubt that he will be able to carry out his stated aims. Khodorkovsky, recently released from jail after receiving a pardoned from Russian President Vladimir Putin in the run-up to the Sochi Winter Olympics, invited Russian public figures to Kiev to discuss with Ukrainian colleagues a “road map” for resolving the current crisis, which has created a rift between the two countries. 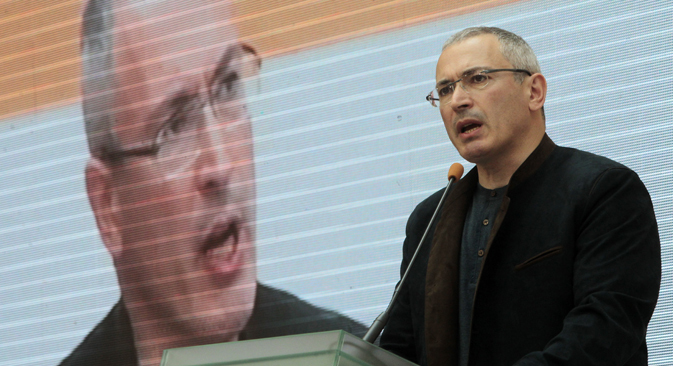 “We are here for various reasons, but primarily because we do not agree with the policies of the President of Russia Vladimir Putin, as it concerns his policies towards Ukraine,” Khodorkovsky said in his opening remarks. He went on to hypothesize that the actions of the Russian leader could be attributed to a desire to punish Ukraine for what he considered to be a personal affront. On the Russian side, the congress was organized by the social movement Open Russia, a fund run by Mikhail Khodorkovsky and the Russian PEN Center writers’ association, and on the Ukrainian side, by a movement called the Third Ukrainian Republic, funded by ex-Interior Minister Yury Lutsenko. “We came here, to Ukraine, to form our own opinions about what is happening, and not just believe Russian propaganda,” said Russian opposition TV anchorwoman Yekaterina Gordeyeva, speaking at the opening of the congress. Also attending the event were political and economic experts, cultural figures and opposition activists. On the first day of the conference, the participants discussed freedom of speech in Ukraine and Russia, which has suffered as a result of the latest quarrel between the two countries. Ukrainian representatives fiercely reproached the Russians about the infamy of working in a country where a TV channel such as NTV (a state-owned channel notorious for sensationalist documentaries and one-sided coverage) operates. The Russians, in their turn, countered that they could not simply storm the Ostankino TV studios in Russia as they claimed Right Sector militants had stormed media outlets in Ukraine. The Russian journalists then left the hall in protest. “I wish I had gone to Slavyansk instead,” one of them said. Sergei Markov, director of the Institute of Political Studies and member of the Public Chamber, believes that Khodorkovsky is trying to find a political niche for himself. “They hate Russia and the Russian character, as this is the task they set for themselves, and Khodorkovsky is being paid good money for this by foreign powers. This is a well-paid promotion of hatred,” Markov told RBTH, outlining his thoughts about the participants of the congress. “Khodorkovsky is telling Ukrainians that there are two Russias, and that they now hate one of these – the authoritarian Russia, but there is another Russia – a democratic one. And so, if he betrays Russia, they will accept him,” added Markov. “If Khodorkovsky is trying to reconcile the current authorities in Kiev with Russia, then this task is impossible,” concluded the expert. “I am glad that all the clownery that will take place there will happen without us being present,” said Milov. According to him, the opposition is quite capable of understanding Russia’s relations with Ukraine without getting involved with discredited liberals. Based on material published by RBC, Forbes, and VZGLYAD.